Martin Luther struggled greatly with James' "not by faith alone" (Jam. 2:24). In fact, he once offered his doctor's cap to anyone who could reconcile it with Romans 3:28 and scoffed at his friend, Philip Melanchthon, for attempting it. To Martin Luther, James was an epistle of straw that had "nothing of the nature of the Gospel about it." Romans 3:28: Therefore we conclude that a man is justified by faith apart from the works of the Law. James 2:24: You see then that a man is justified by works and not by faith alone. You can see that, on the surface, these two verses do contradict. "Faith apart from works" cannot be reconciled in any way with "by works and not by faith alone." Numerous attempts have been made to reconcile "not by faith alone" with our salvation by faith alone. A favorite of evangelicals is to say, "We are saved by faith alone but not by faith that is alone." That's a way of saying that faith alone saves us, but faith will produce works. It's an interesting attempt to reconcile these passages, but it really doesn't do them full service. If we are going to explain "not by faith alone," we ought to explain them the way Paul and James would have, and I believe Paul explains himself plenty well enough to do that. Paul was a careful theologian, and Romans is a careful explanation of his theology. All the answers we need are right in his letter. Paul spoke of salvation in the past tense and salvation in the future tense, each with different requirements. Paul's past-tense and future-tense salvation may not leap out at you at first glance, but once it's been said to you, you'll see it everywhere. It's most apparent in Romans 5:9-10. Much more then, having been justified by his blood, we shall be saved from wrath through him. For if, when we were enemies, we were reconciled to God by the death of his Son, much more, being reconciled, we shall be saved by his life. Do you notice that each past-tense reference relates to the death of Christ, and each future-tense reference relates to the life of Christ in us? In the past tense, Paul always speaks of the death and blood of Christ, which saved us and forgave us of our sins. In the future tense, he always refers to the life of Christ working in us—by the Spirit and by grace—and he always refers to works. For by grace are you saved through faith, and that not of yourselves. It is the gift of God, not of works, lest any man should boast. Here Paul refers to salvation in the past tense. In fact, the literal Greek would read, "for by grace are you having been saved through faith." For this you know: that no fornicator, unclean person, or covetous man has any inheritance in the kingdom of Christ and of God. While Ephesians 5:5 does not specifically use the word "works," it is clear that he is saying "not by faith alone." There are plenty of other verses, however, which do specifically use works (or a synonym). 2 Cor. 5:10: For we must all appear before the judgment seat of Christ to receive the deeds done in the body, whether good or bad. Rom. 2:6-7: [God] will repay every man according to his works. To those who seek after glory, honor, and immortality by patiently continuing to do good, [he will repay] eternal life. Gal: 6:8-9: He that sows to the Spirit shall reap everlasting life from the Spirit. Let us not grow weary in doing good, for in due season we shall reap [eternal life], if we do not faint. We could go on, but those are good, clear verses. You will find Paul absolutely consistent in this respect. Thus we find that Paul completely agrees with James. Salvation is only by faith alone if we are speaking in the past tense of our forgiveness from sins, and our entrance into Christ. When we begin speaking in the future tense of judgment, eternal life, and entering the kingdom of heaven, there we find Paul agreeing with James. Future-tense salvation is not by faith alone. Let's be clear that good works are only done by the Spirit of God. Romans 7 describes the awful state of those who would seek to do good works in their own strength by rules, commands, or the Law. Paul tells us that we will only live [eternally] if we put to death the deeds of the body by the Spirit (Rom. 8:13). If we live according to the flesh, he says, we will die. Paul was carefully explaining his theology in Romans because he was being misquoted and slandered. In that careful explanation he divides our deliverance from sin in the past tense from our future rewards. Even where he is not carefully explaining himself, he is enough of a theologian to be consistent in his terminology. James, on the other hand, is exhorting believers who are excusing their lifestyles by leaning on salvation by faith. He is not carefully explaining his Gospel. He speaks generally of salvation, and he says it involves both faith and works. With that Paul would completely agree with. 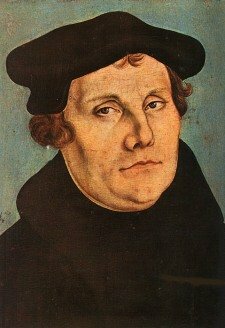 It does make me wonder that if Martin Luther was still alive, would he give me his doctor's cap? There is a much fuller explanation of all this on my Sola Fide page.